Additional Info: 22inchTelevison with built in DVD player for one bedroom. Little box of toys to help entertain whislt in caravan. Any date after the 9th of March as site is closed until then. A beautiful fully furnished 8 berth caravan situated on Haggerston Castle Haven site. It has just had new curtains, new bedding on all beds, new carpet in living room and bedrooms and lino in the toilets the place looks fresh and new. The place is well maintained and would love for everyone to enjoy as much as we do. Outdoor furniture and grassed area around caravan. Near the lake and not to far from the entertainment and main house. 22” television with built in DVD player in one bedroom. A £50 non refundable deposit must be made to secure the date and there will be an additional £50 breakages fee if caravan is fine u will get the £50 back within 7 days. Please feel free to text or ring or email me. 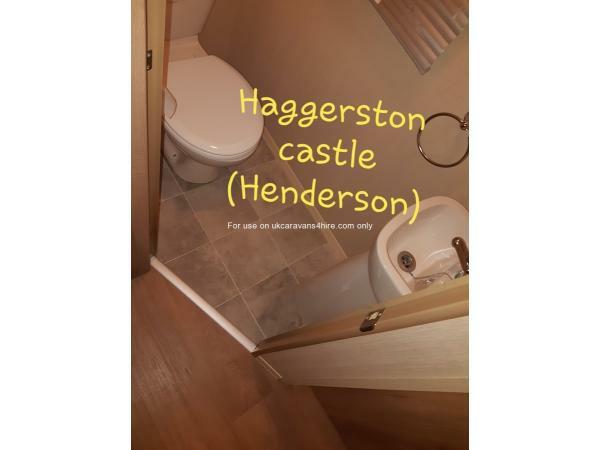 I'm here to help and give what ever information i can to help you have the best time here at Haggerston Castle whilst hiring our holiday home. There is a copy of the everything in a file in the caravan.